A big part of the "change" in climate change seems to be more frequent severe weather, including lightning storms here on the Eastern Shore of Nova Scotia where I live (see map). Charles Moore lives in rural Nova Scotia. Power blackouts are not uncommon here, but were historically most often fall or winter events caused by windstorms dropping trees and branches on power lines, heavy wet snow, and ice storms. We're getting more of that than ever, but spring and summer blackouts, once a rarity, are becoming so common that it's really a year-round problem. The last two power outages we've had here have been caused not by wind but by lightning strikes, electrical storms seemingly both more frequent and more violent than I recall from years ago. The latest one this week was a spectacular and noisy bit of weather that parked over us for several hours. 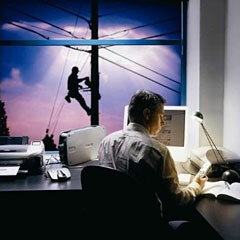 Neither lightning storms nor power blackouts are unique to this part of the world - US Department of Energy data indicates that outage frequency increased throughout the past decade, and a study conducted by Lawrence Berkeley National Laboratory (Berkeley Lab) researchers in 2005 for the US Department of Energy's Office of Electric Transmission and Distribution estimated that power outages and blackouts cost the US about $80 billion annually. When the power cuts out, portables instantly shift to battery power, preserving any unsaved work and allowing you to finish whatever you were doing gracefully. The same kind of security and ability to carry on computing with a desktop machine would require a really big (and expensive) uninterruptible power supply (UPS), which also would add another layer of complication and clutter - and perhaps cancel out the price advantage of using a desktop machine. However, internal battery charges are limited to 6 to 8 hours even if one is fortunate enough to own one of the latest MacBooks or MacBook Pros with their built-in, extended life batteries. I can get about five hours from an extended-life battery in my old Pismo PowerBook, and with three batteries that will get me through a couple of days with a bit of conservation prudence exercised, but eventually the batteries are drained, and if the power isn't back on yet, you need backup. There are several possible modes. You can keep a laptop computer going with a cheap power inverter and a car battery, and you should be able to ride out even a lengthy power interruptions if you have a means of periodically recharging the battery. I have a 700 amp rechargeable power pack, which has an automobile cigarette-lighter type socket into which one can plug 12 volt items, such as my Kensington 70 watt Auto Air power adapter (unfortunately now discontinued). 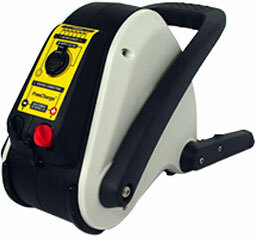 I also have a little 300 amp power inverter that converts 12 volts DC (i.e. : a car battery) into 120 volts AC, but I prefer to use the Kensington device because the inverter itself draws a fair bit of charge. Running a laptop computer with this setup involves stepping 12 volts DC up to 110 volts AC, and then back down to 24 volts DC with the laptop's AC adapter - a power-wasting process. A more elegant solution is Xantrex Technologies 852-0400 XPower PowerSource 400-watt Back-up Power Solution, which is available from Amazon.com for $139.99 with free ground shipping (continental US). I don't have one of these yet, but I'd like to. 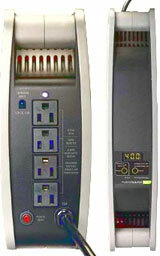 The PowerSource 400 is claimed to be able to supply up to eight hours of uninterrupted backup power to devices such as a small TV, a radio, a laptop computer, or even a desktop computer and LCD monitor, an inkjet printer, a copier/printer/fax/scanner, an Internet modem, a VoIP phone, a cell phone, or a cordless phone, allowing you to keep working and stay productive through power blackouts, avoiding missed deadlines and so forth. 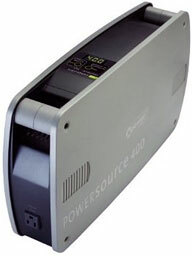 The PowerSource 400 switches to backup power automatically and seamlessly when a power outage occurs, so connected devices won't sense the power outage at all. When grid power returns, it switches them back to utility power, recharges its internal battery, and lapses into standby mode until the next outage occurs. The unit incorporates five AC outlets with surge protection, measures 19" x 4" x 11", weighs 38 pounds, and its styling harmonizes nicely with Apple hardware. For even longer outages. the $299 Freeplay Weza Portable Energy Source is a versatile gadget that can keep you going more or less indefinitely, so long as you have the stamina to keep stomping on its actuator treadle to generate electricity. Freeplay says the Weza can generate enough juice via a cigarette lighter adapter to jump-start a boat or automobile battery - or to power a wide array of instruments and accessories, from 25 to 40 watts, depending upon the amount of effort applied. The Weza has an internal rechargeable non-spill 12V, 7 Ah lead-acid gel battery, which can be less laboriously charged from AC (with its AC adapter) or DC power in about 8 hours. It can be charged from any DC source that provides 13V to 21V, such as wind turbines or solar panels for really green, off-the-grid computing.